Oh my gosh guys, today is the freakin’ day! Finally, our Kitchen Reveal with Dark Cabinets and Open Shelving. I’m so excited to show you the whole thing!! You know what else? Today marks the 40th time I’ve posted about our kitchen. There are 39 posts that are linked at the bottom of this post that host all the DIYs, design boards; you name it! 39 posts?! Crazy, right?! The backstory of our kitchen renovation in a nutshell is this… We decided that we were going to lightly update the kitchen about three years ago. Lightly meaning, take down wallpaper, paint, add new lighting… you know, that type of thing. Well, we did a few of those things and then started tacking on a few more. Then, all of sudden, Luke came home from work one day and I had taken the kitchen cabinets off the wall. So, to be completely honest, we had not saved for a kitchen renovation because we weren’t planning on doing a kitchen renovation. 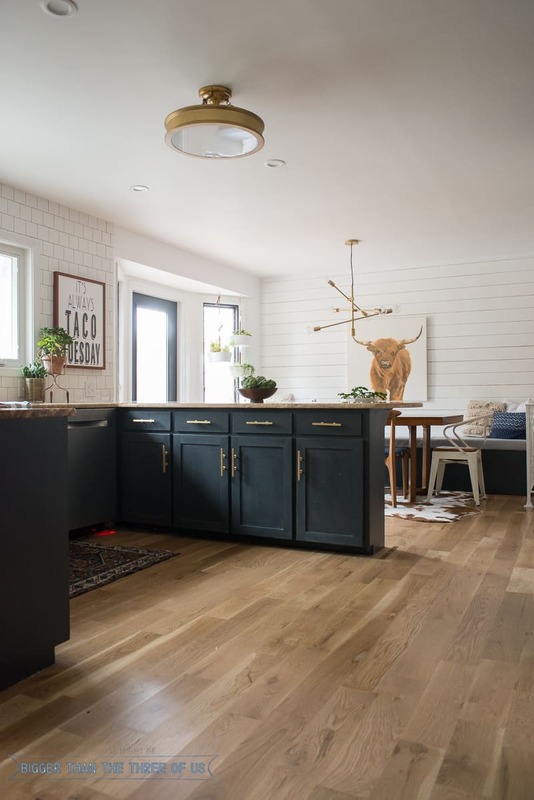 As we kept doing or dreaming about projects, we realized that we could have a pretty fantastic (it might not be my dream kitchen, but it’s close) kitchen if we took it slow and just paid for products as we had the cash for them. So, that’s why this project has been the longest project ever. I think that next time around (for example, our basement remodel) we will have a more clear picture of what we want to do beforehand and how much it’s going to cost. I can totally live through a one year project but I don’t want another project to span over the course of a few years. Live and learn, right? 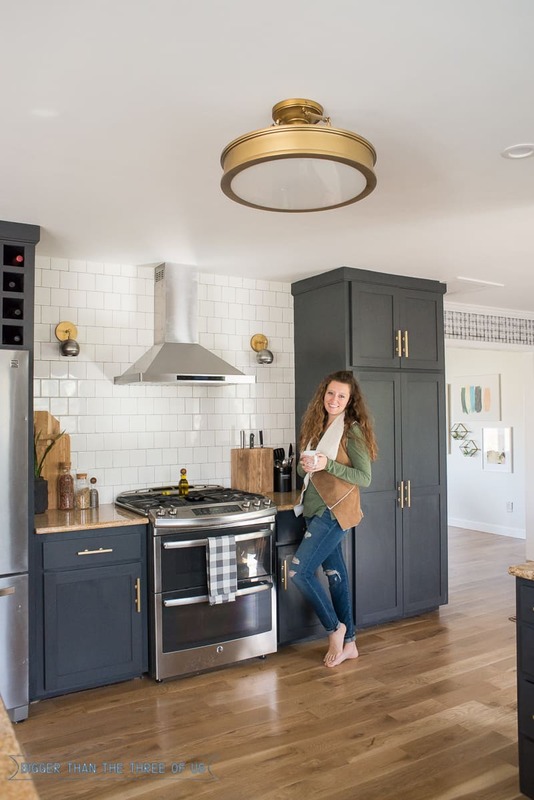 Without further adieu, grab a cup of coffee with me and let’s chat about the kitchen. ** Posted 08/24/17: After you read the reveal, if you are curious to see what the kitchen looks like today (10 months later) and to see if we still love everything including that open shelving… click over to see Kitchen Updates and What We Love About Our Kitchen. If you’re a recent reader, then you may not have see the kitchen before the renovation. So, I’m going to back up and share a few pictures of the before and then we can get into the nitty-gritty of what we decided to do and why. There was a small pantry but it had a separation between the two sides which made it awkward to store things in. The desk was just a clutter trap for us. There was a small doorway between the kitchen and the formal dining with two mini doors. The doors seemed to add to an already awkward space and made the formal dining seem much too formal for us. We decided to get rid of the desk, move the oven to where the desk was and reconfigure the wall that would house the oven. That would enable us to open up the wall between the formal dining and the kitchen. We gained about two more feet by opening up that wall, but you would have thought it was six feet! It made a huge impact! I knew from the previous pantry that I wanted a pantry that would be more usable. We don’t have a ton of kitchen items. We are more of the mindset to have a few amazing knifes and pans instead of having just tons of both. So, of course we needed storage, but I didn’t feel like we needed to have storage everywhere. Let’s chat about some specifics on why we chose what and what was original that we kept. We took down all the upper cabinets and also removed the bunkhead. Once the cabinets were down and the bunkhead removed, we realized that our kitchen could feel so much more inviting if the window was larger. We had a five foot window put in and that was a complete game-changer! It’s so nice to see more of the backyard and enjoy the yummy light that streams through the window. Before the renovation started, we knew that we had asbestos in the popcorn ceiling. When we took down the upper cabinets, we had to put in new drywall because there wasn’t any drywall above the cabinets. We love the look of a smooth ceilings but didn’t want to shell out the money to have the asbestos abated. My grandpa had a popcorn sprayer (from the old days when he was a home builder). We sprayed popcorn and tried to match the color that was there but it just wasn’t working. So, a few months passed and we were able to afford the asbestos abatement and drywall install. It was a pretty big investment but totally worth it. We kept the original cabinets (in the peninsula) as well as the granite. Neither one would be my choice, but we were trying to save where we could. For the base cabinets, we painted them Cracked Pepper by Behr but color-matched that to Benjamin Moore Advance. The BM advance line is fantastic on wood. My Grandpa and I built the base cabinets that flank the oven, the fridge enclosure and the pantry. It was quite the job. I learned so much through the process and am so grateful that I got to do that with my Grandpa. During the process we went back and forth on the cabinet doors. We finally decided to buy them from a cabinet shop in town and it made sense to buy them for the whole kitchen and not just the new pieces. There’s a post at the bottom that is just about the doors and includes lots of information on pricing, etc. 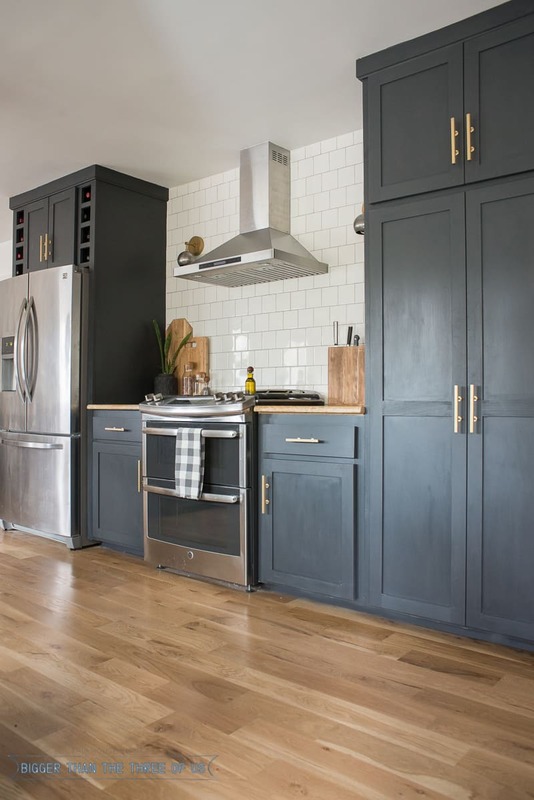 You’ll want to check it out because cabinet doors are super affordable! Like not much more than if you were just buying the hinges for the doors at your hardware store. We saved the leftover piece of granite from the old desk that was in the kitchen and had a granite store cut it in half. We used that measurement for the base cabinets that flank the oven. By doing that, we saved a lot of money. I believe cutting and polishing the granite was around $100. The pantry includes a built-in coffee bar and also houses our microwave. It’s not the biggest space but it’s mighty. 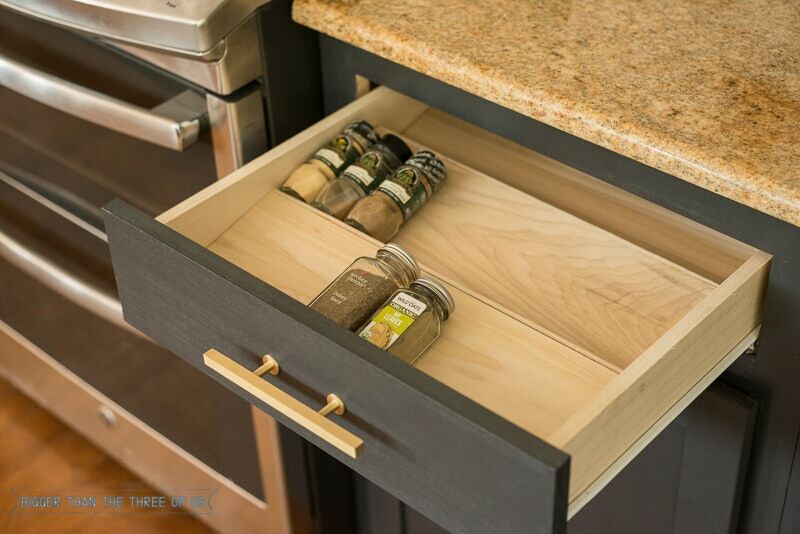 Another hardworking space in the kitchen is our spice drawer. It’s a DIY and has been so incredible. 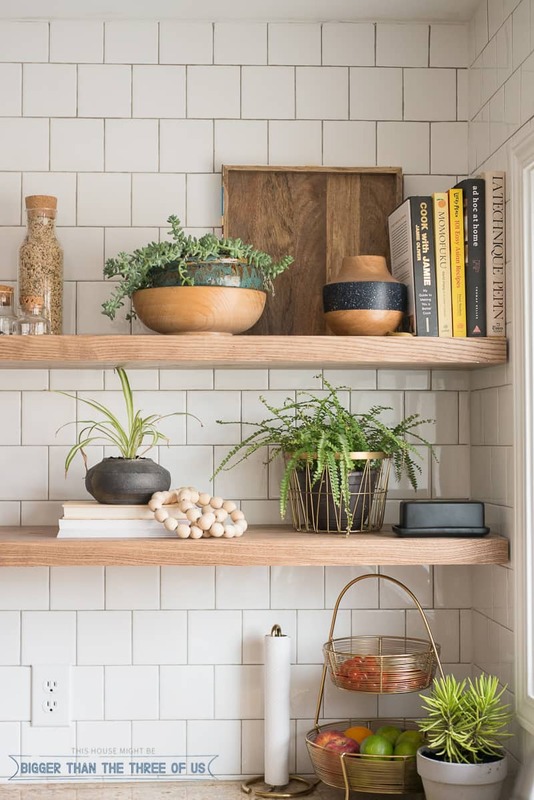 The open shelving was definitely a must-have in our kitchen. 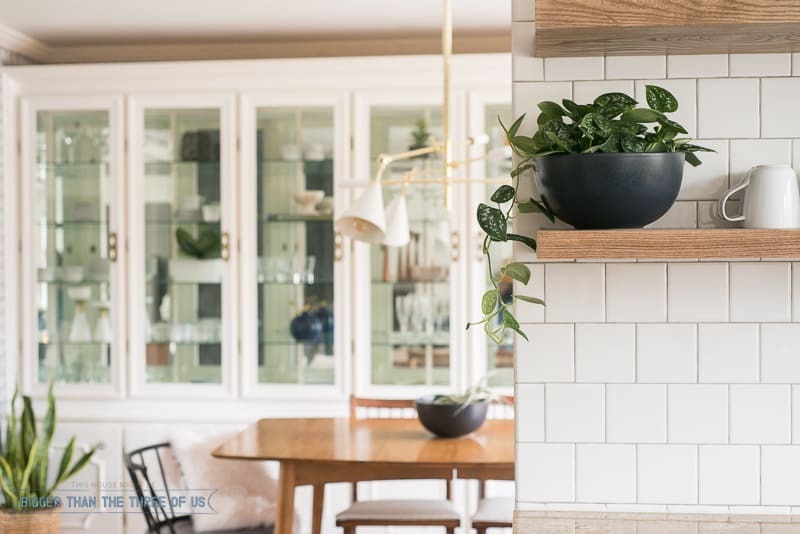 See the kitchen shelving tutorial for all the details! We used steel mounts from Etsy to hang the shelves. The shelves are Ash that I stained with a light oak. I love the look they give our kitchen. 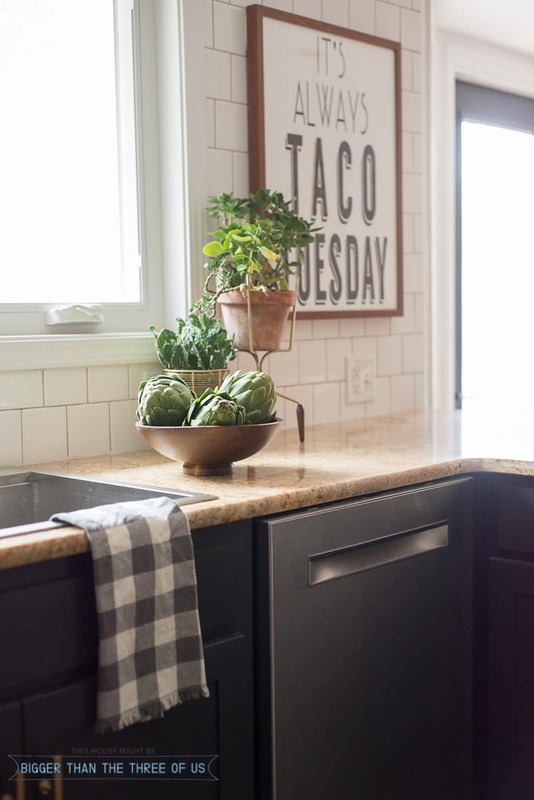 If I had to rank my favorites in the kitchen the shelving would be first, then the automatic faucet (oh my gosh, it’s the best) and then our taco print. We went with a stainless one-basin sink and absolutely love the one-basin. I kinda splurged on the automatic faucet. You can run your hand over the top and it will stay on for thirty seconds or underneath and it will stay on for ten seconds. I really love that!! I couldn’t find a specific art piece that just felt right for us so I decided to make one. “It’s Always Taco Tuesday” is such a perfect piece for us. I’m selling them in my Society 6 shop if you love it too! Framebridge was kind enough to frame it for me. It’s totally drool-worthy in that frame! How about a few more pictures? We did most of the work on the kitchen ourselves, but did hire out the asbestos abatement, gas line, wood flooring and window enlargement. I know you all will ask “How much did it cost”? To be honest, we didn’t keep a tab. We started the process and didn’t know we were going to do a whole renovation. I think we spent in the ballpark of $15,000. With all new appliances, the asbestos/drywall work, new flooring and window… that all came to around 12,000. I think we spent the rest on all the other little things that go with a renovation. I will have to say that the total includes the eat-in kitchen too. Check out the original reveal of the eat-in kitchen if you missed that last year or check-out the updated space post that I did a few weeks ago. I’m so happy to have this remodel behind us. It was the biggest job we have ever taken on and we absolutely love how it turned out. 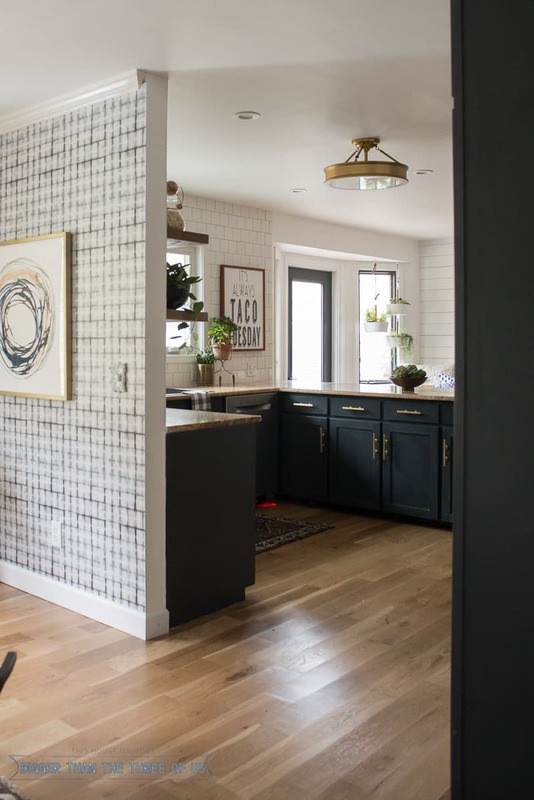 If you missed the formal dining room reveal – make sure to check that out too! *Affiliate links are below. It does not cost you anything to shop from my link. I make a very small percentage based on what you buy. Thanks for supporting this blog! (post 1 number was published on 12/18/2013! – can we say longest DIY ever?) To be fair, we actually started the kitchen in April 2014. ha! Posted 08/24/17: **Don’t forget to check out what the kitchen looks like today (10 months later) and to see if we still love everything including that open shelving… click over to see Our Kitchen Updates and What We Love About the Kitchen. 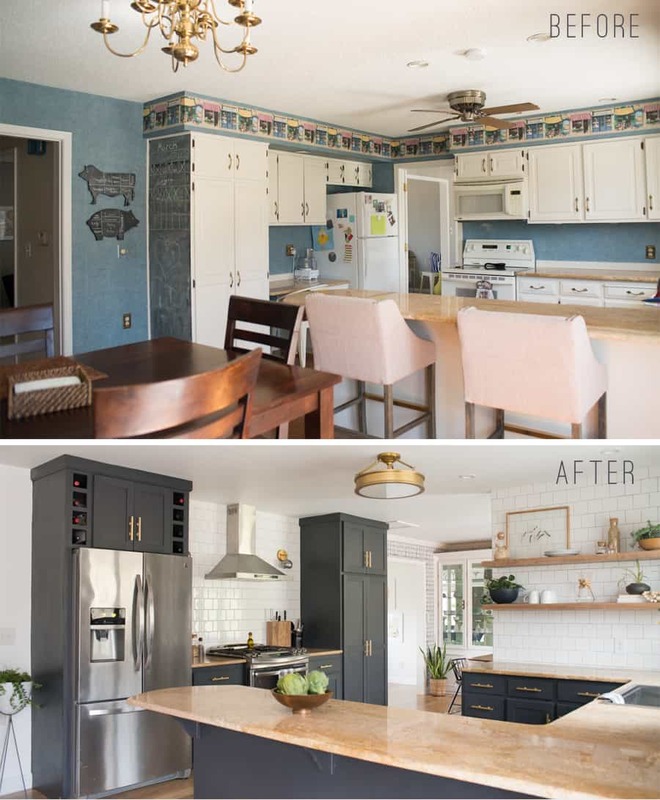 Wow Ashley – I never saw the starting point for your kitchen before and I am just stunned by the transformation. It’s amazing! Kudos!! I totally love that you got to work with your Grandpa on so much of it. What a great story!! Thanks Tricia! It’s definitely come a long ways! Love it, Ashley!!!! Absolutely beautiful. Thanks Christi!! We can’t wait to make memories in there. Wow, gorgeous! I mean, every last detail so well thought out. I thought I was the only one dealing with a kitchen remodel taking forever, but I’m not alone, and that makes me feel so much better. Even so, the fact that y’all did so much yourselves puts me to shame. I just had bad luck with contracted work. LOL! Anyhow, this is magazine worthy, and I truly hope it is given the chance to be seen by all. Congratulations! 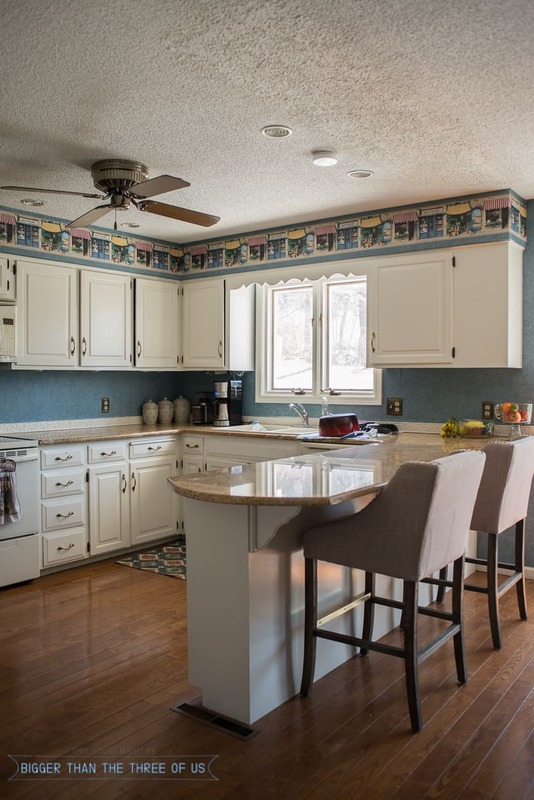 Your kitchen looks great- you did a wonderful job on it! Ashley I did a double take when I saw the before and after pics. I think the colors you have chosen make it look modern and sophisticated and in keeping with your aesthetic. And the best part for me was that you got to share the work with your grandpa. There is nothing like DIY to keep a family together. Thanks Mary! The before/afters kinda shocked us too! Love that I have that memory for sure! Are you joking me right now?! This is seriously perfect! You guys did an amazing job and I love your style! 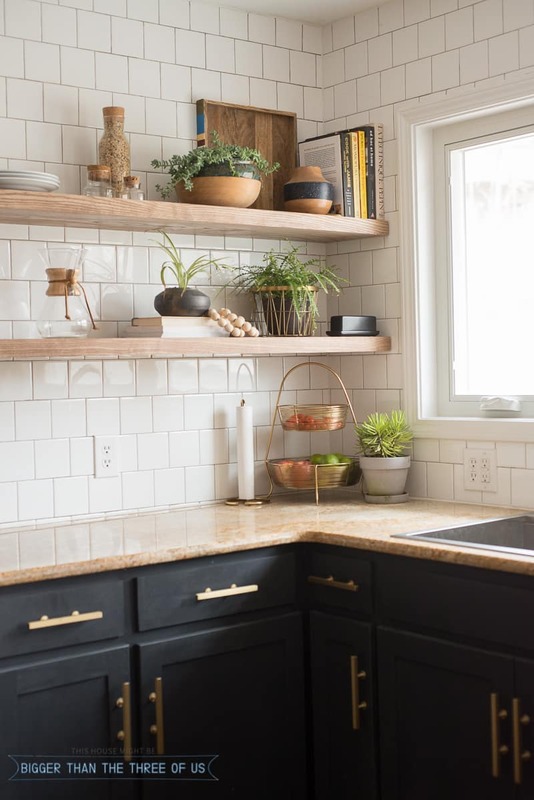 We are on the verge of starting a kitchen reno and those gold bar handles are exactly what I’ve been looking for! You are the sweetest! Thank you so much. The gold bar pulls are a bit expensive but totally worth it! They are so gorgeous and really have done well in our messy household! Good luck with your renovation! Wondering where you got the gorgeous golden handle bars? Love your kitchen btw.!!! I love all your lighting fixtures! I just checked some of them out- WAY more affordable than places i was looking at that had similar styles! 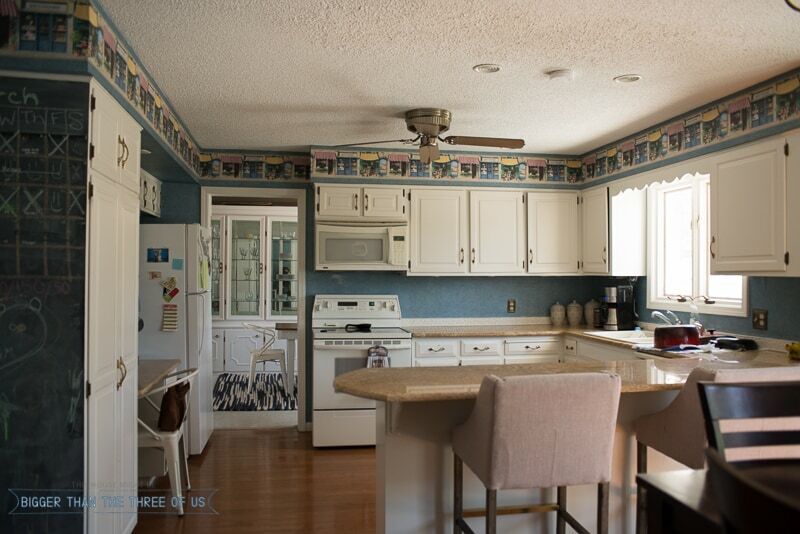 We’ve done a ton of our own remodeling too, and always have things like the countertops where you think, “I really wish we weren’t keeping that to save money…” but then at the end, it’s the piece that makes yours look just a little more like your own 🙂 Fantastic job! Yay! Glad you found some of them for cheap! Thanks so much for your lovely comments! Thanks Kristen! If you google standard fridge and fridge enclosure guidelines… then you will get a pretty good idea. 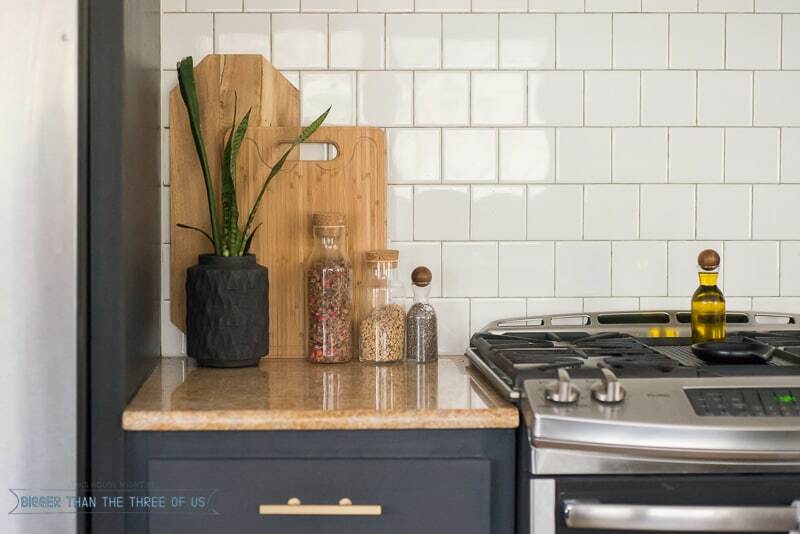 You need to allow a few inches on top for the fridge to vent and the enclosure will definitely be a different size if you choose counter-depth or regular-depth fridge. Thanks so much! The lighting really helped make it. How do you like your single basin kitchen sink? I didn’t see a source for it. I’ve never had a single basin but really like the way they look. I’m curious to know how it is for functionality. We love it!! I missed linking it up. I got it from Amazon and it was around $400. In a perfect world, food would not get stuck in the corners but other than that, I really love it. what a stunning Reno! We are moved out and renovating our whole main floor and your kitchen is almost a spitting image of what we are planning. Minus the gold detail we could be twins! Drywall starts monday and I am so excited to finally be putting it back together! I absolutely love so many of the details! 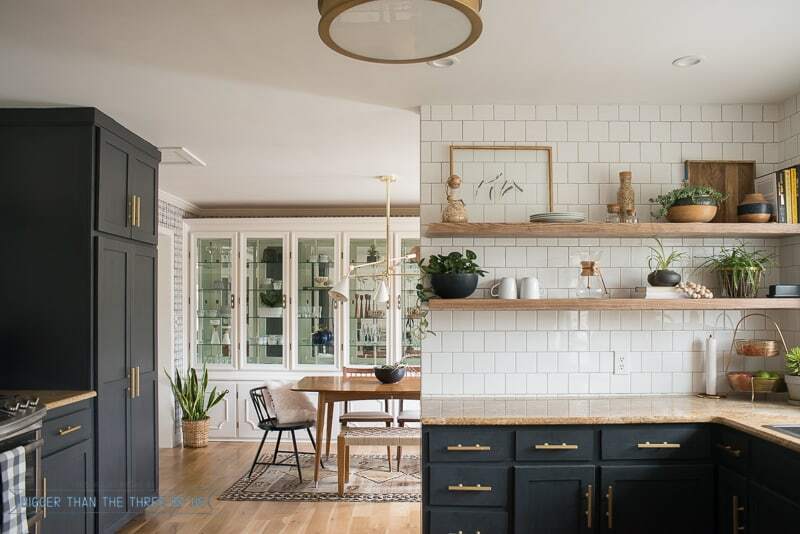 How amazing that you built those cabinets with your grandpa and really such a beautiful space. I am curious why don’t you have stools at the island after the reno. The old ones looked pretty huge but I was surprised you didn’t have a couple small stools tucked in there. Thanks for sharing – pinning to show hubby! inspirational for us! Thank you! Thanks Jess! We have stools now but they were backordered so I didn’t have them in time to shoot the kitchen reveal. =) We have leather round one’s without a back so they fit underneath the counter when not in use. Best of luck with your kitchen reno – I’m sure it will be amazing! You are killin’ it! 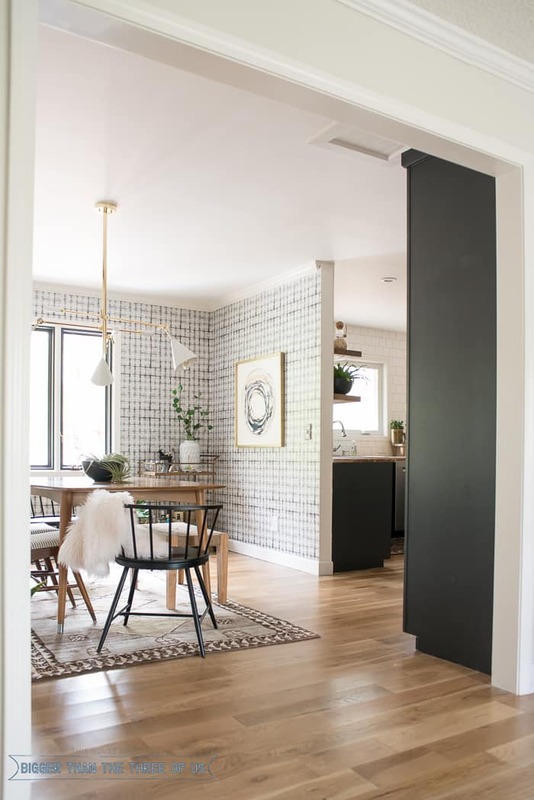 What an incredible “budget” reno. 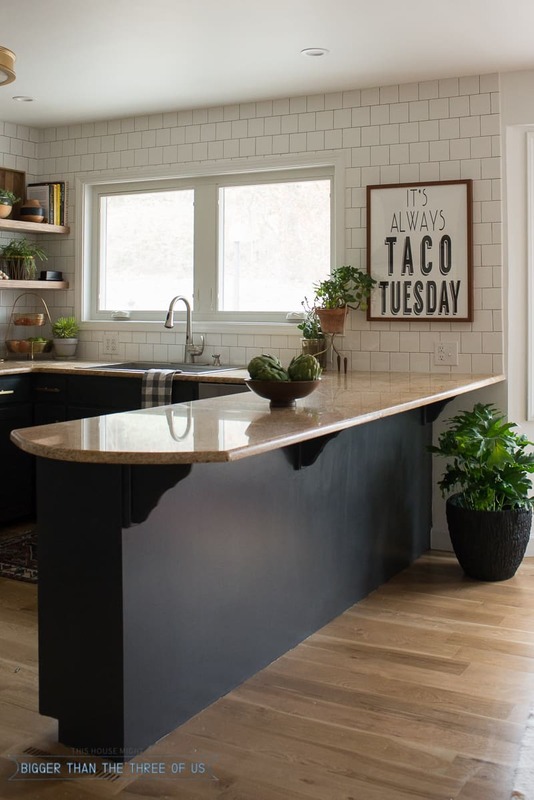 Thanks for showing us how blah kitchens can be fabulous without a complete gut reno. You are so sweet! Thanks Sarah! I love how this turned out. I have really been wanting to go Black with gold handles but I have Stainless Steel appliances and wasn’t sure I could get away with it. I really love how the room has great light with the dark and the mix of gold and stainless steel. There is hope for me. Glad you feel inspired, Michelle! Do you have rough dimensions you can share? It’s a gorgeous makeover! What dimensions are you wanting? Can you share rough dimensions? It’s gorgeous! What color white did you use on the kitchen walls? 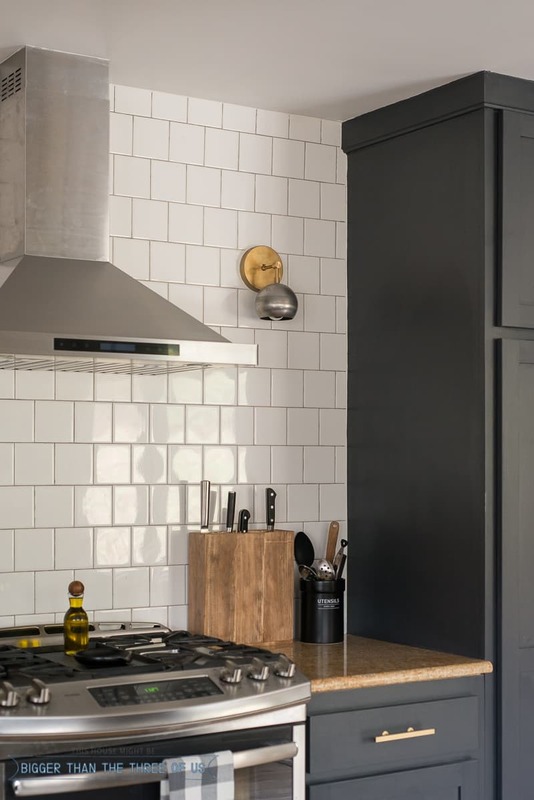 We have black cabinets too and I like the softness it brings to the space. Hi Lisa. It’s Simply White by Valspar. It’s a bright white with a blue undertone in person …. definitely love how it pairs with our cabinets. Hope that helps! Can you tell me the name of the light that you have in the kitchen. I searched for it at wayfair but the link just takes you to wayfair. LOVE LOVE LOVE the kitchen!!! The gold handles and accents TOTALLY tie n with ur granite countertops!!! No need to change out counters!!! Also, at first I thought u did the white subway tile on the backsplash & walls but after a closer look, saw it was regular white tile! 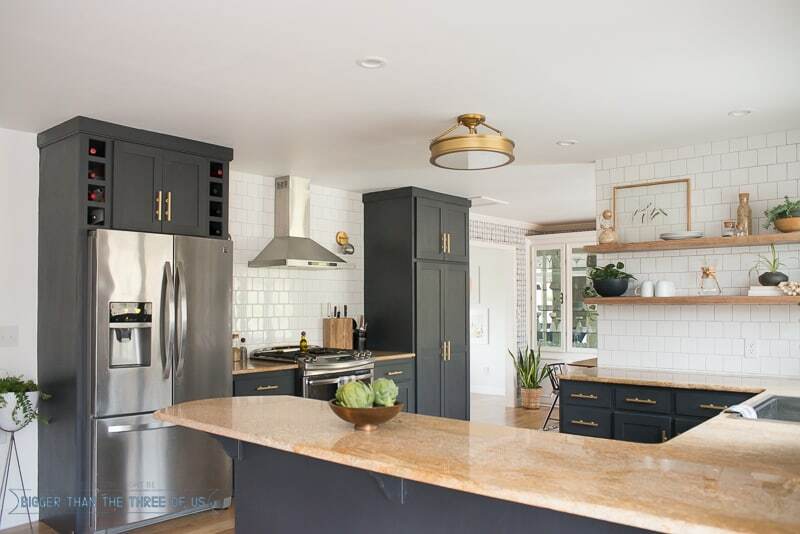 It’s a different twist on subway tile mania but also wondered if it was less costly?!? I’m sure it took a bit longer since tiles r smaller but LOOKS FANTASTIC!! WELL DONE!!!!!!! Awww, thanks Pamela! We tried to pick accessories that would tie in the granite since the granite was in good condition. The square tile is super affordable. I’m not sure how it compares with subway tile but the square tile is around .60 a square foot. Love you kitchen! I wanted to go with white cabinets nut I’m loving the dark cabinets!! Now i can’t decide 🙁 Are you missing the upper cabinets???? Did you not need a lot of storage??? Hi Alma. 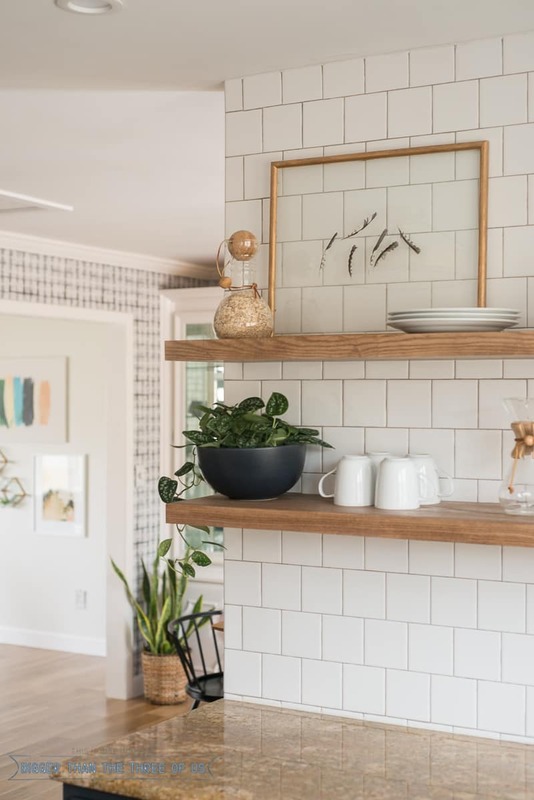 I absolutely love the open shelving and am fine with not having the uppers BUT if you are a person that likes to have lots of dishes, cups, etc,. it’s probably not a good choice for you. I have enough storage but that’s something to take into account for sure. 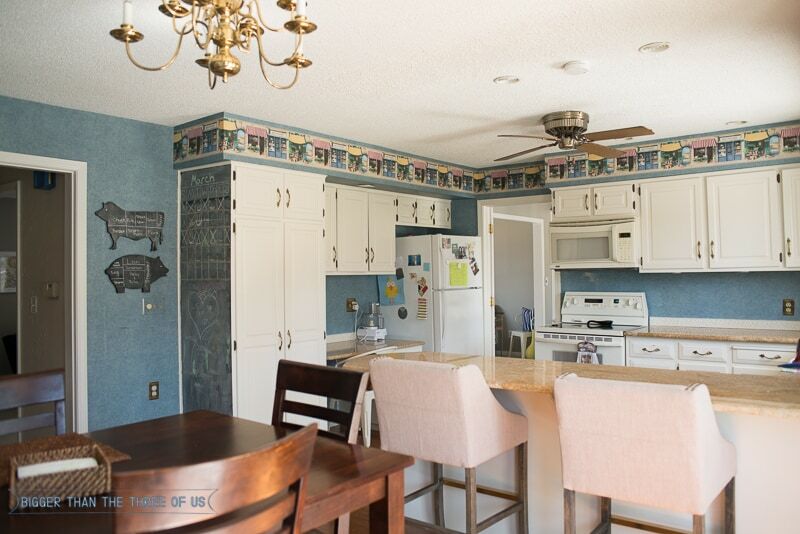 Sorry for the duplicity… wondering what color are the cabinets and what sort of paint or the finish of the paint? And Is there any specifics on repainting them that you took? Awww, thanks! Definitely granite and original to when we bought the house. Looks awesome! Any chance you remember the grout colour you used for the backsplash? Love this kitchen! 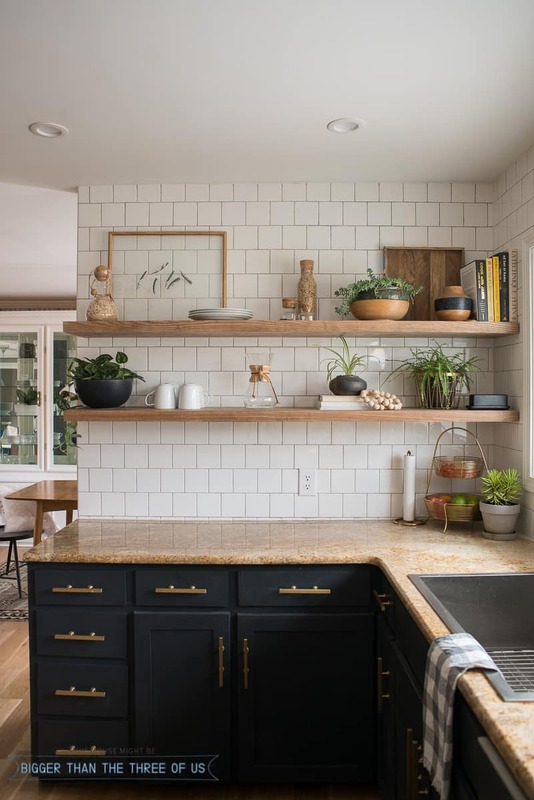 Can you give more details about the backsplash? Size and glossy vs. matte? Thank you! 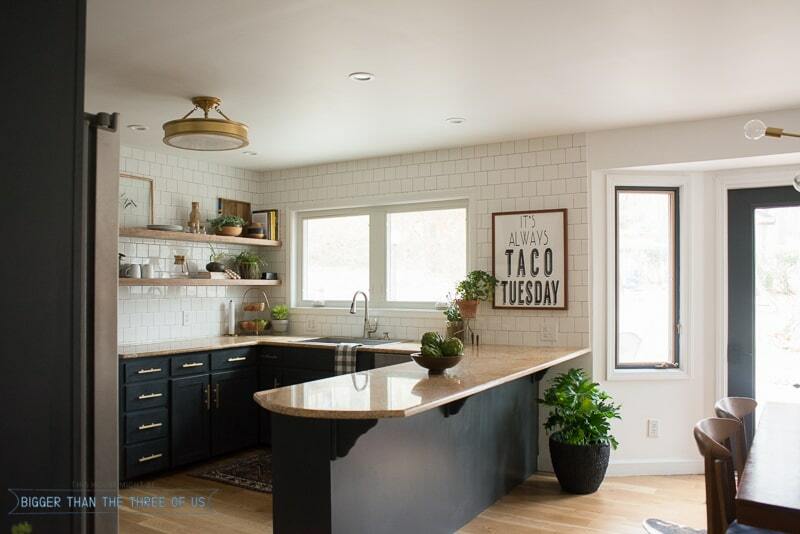 Ashley, so fun to check out your kitchen remodel! 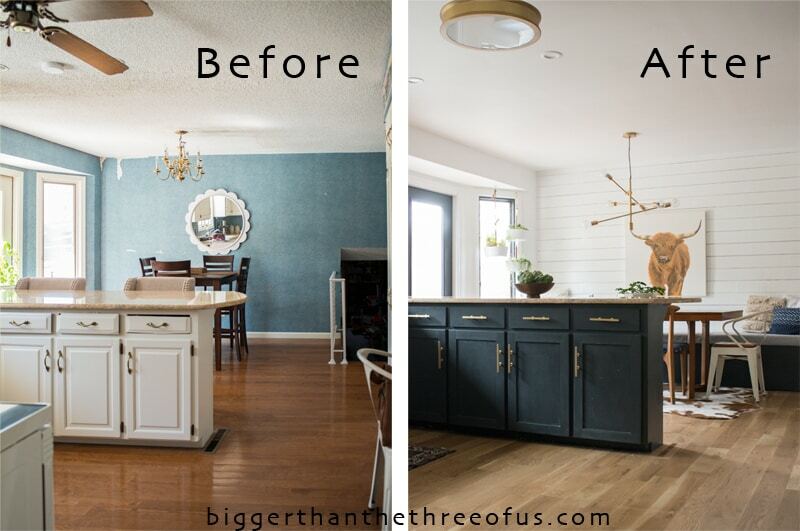 We have a similar layout in need of a reno and I love seeing how you reconfigured your space. The fact that you and your grandpa built some of those cabinets and worked on this together is just about the best thing ever!! It all came out beautifully! Awww, thanks Lisa! We absolutely love it (and for the price… it really can’t be beat!). Thanks for your super sweet comment. 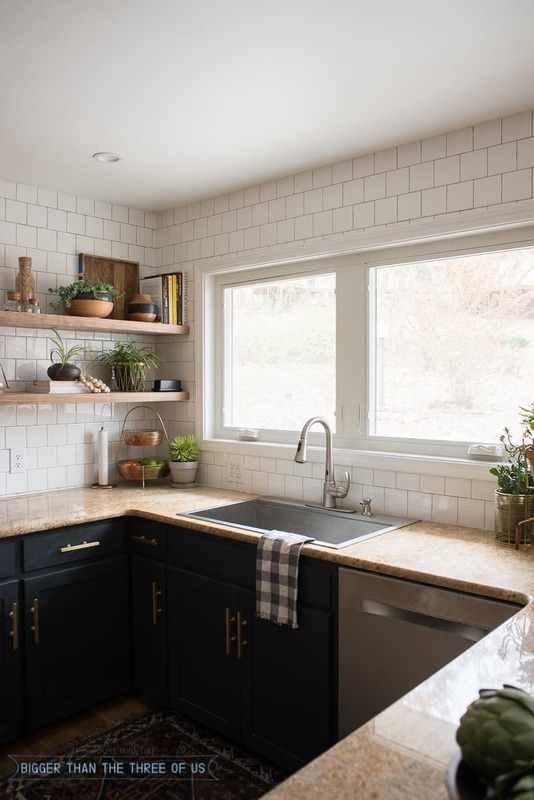 Where did you find your white back splash tile? love the shape! It’s linked below but it’s from Home Depot. I recently painted my cabinets this same color bc I loved yours so much. I’m interested in the name of the dark charcoal color you painted frame and door? Also did you paint your walls and trim the same color white? Thanks Val! It’s actually the same color! And yes, ultra white in semi gloss for the trim and eggshell for the walls. So fun to check out your kitchen remodel! Hi there! Just wanted to stop back by and thank you guys for your tips and tutorials. We re-did our kitchen ( replaced upper cabinets with floatingeccom shelves, painted cabinets etc.). We used a lot of your good info and recommendations (brackets, hood, primer, Paint. Wish I could post pictures! Hi Tracie! Thanks so much for taking the time to write a comment! I bet your kitchen turned out beautifully! If you ever post on IG, just tag me! I’d love to see the kitchen.